I learned this figure at the St. Louis Exposition, in November, 1904, from the two Navaho girls, from Gallup, New Mexico, who taught me the other Navaho figures. 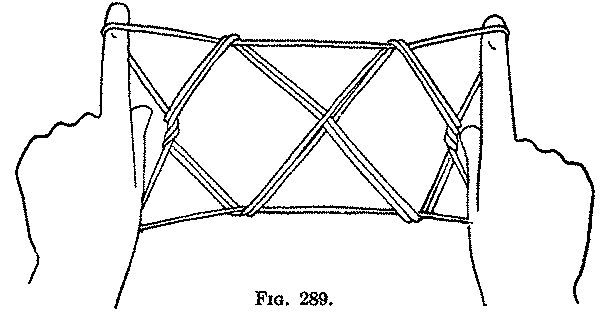 Second: Transfer the index loops to the thumbs, by putting each thumb from below into the index loop, withdrawing the index, and returning the thumb to its position. 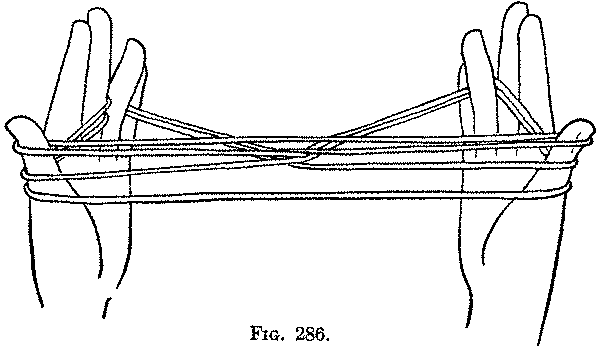 Third: Transfer the little finger loops to the thumbs, by bending each thumb away from you over the far thumb strings, and taking up from below on the back of the thumb the near little finger string; and then withdrawing the little finger, return the thumb to its position. You now have three loops on each thumb (Fig. 285). Keep them well separated on the thumb: the original loop down at the base, the loop taken from the index halfway up, and the loop taken from the little finger near the tip. Fourth: Put each ring finger from below through the two lower thumb loops, and, pushing the two lower far strings away from you with the back of this finger (Fig. 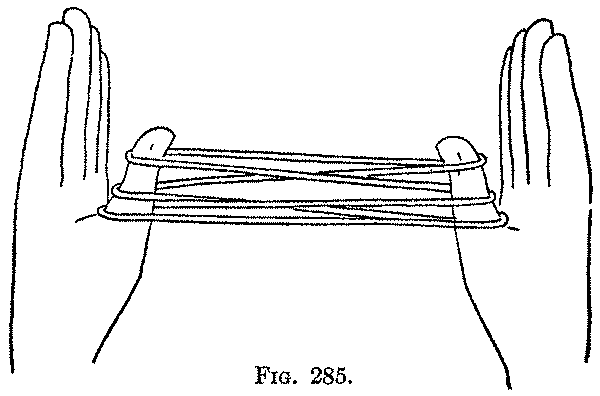 286), bend the ring finger toward you over the upper far thumb string (the far string which passes directly from thumb to thumb), draw it down, and hold it by closing the ring and little fingers over it on the palm (Fig. 287). Fifth: Turn the hands so that the thumbs, index fingers and middle fingers point away from you; then bending the index and middle finger pass the middle finger toward you through the thumb loops, and pass the index toward you into the two upper thumb loops and then between the two upper near thumb strings and the lower near thumb string (the near string which passes directly from thumb to thumb) (Fig. 288). Now, holding this lower near thumb string between the index and middle finger, draw these fingers away from you, and, by turning the index down and then away from you, take the string up on the tip of the finger. 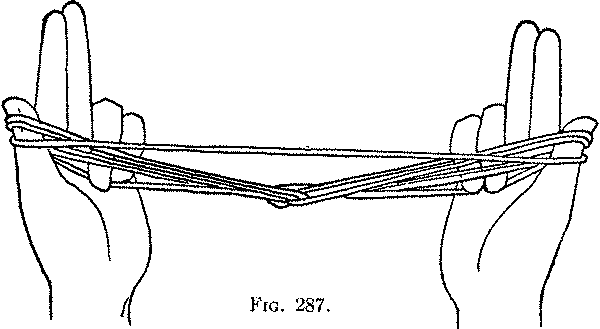 Sixth: Release the loops from the thumbs, and, turning the palms away from you, extend the figure between the index fingers and the ring and little fingers closed on the palm (Fig. 289). So far as I know, this figure is the only one in which, after Opening A, three loops are arranged on both thumbs.